Micheal E. Dean has been appointed senior pastor of Sabetha UB church in Sabetha, Kansas. He holds a local conference license. Global Ministries is developing a strategic relationship with Samaritan’s Purse. The goal is to strengthen our relief and development efforts as a mission agency while unifying our denomination’s overall response to humanitarian need around the world. In order to serve local churches, we will be receiving donations for Samaritan’s Purse and passing them on without charging any administration fees. We only ask that you indicate to which project(s) the amount is to be directed. From year to year we will be able to report to you how much was given to relief needs as a denomination and individual churches. In addition, the only follow up mailings from Samaritan’s Purse will be those received by Global Ministries, not the local church or donors. We’ll be sure to keep you informed of the continuing needs and opportunities to contribute. Currently, Samaritan’s Purse is heavily involved in caring for the needs of those in Myanmar who were victims of Cyclone Nargis and earthquake survivors in Szechuan Province in China. More information can be found at SamaritansPurse.org. Mike Brown, pastor of Franklin UB church (New Albany, Ohio), joined Global Ministries Director Jeff Bleijerveld in the Philippines in early May, as our churches there celebrated their 25th anniversary. 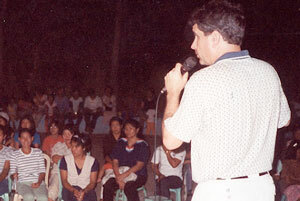 That’s Mike in the photo, preaching in the Philippines in 2006. As Mike began the 13-hour flight from Detroit to Japan, he prayed for an opportunity to witness. Here is what happened, in his own words. The first 4-5 hours I slept and did some work. Sitting beside me was a Japanese man who appeared to be in his early 30s. Sitting beside him were a man and woman in their 60s. While I was working, the three of them engaged in a lot of conversation. When I wrapped-up my work and leaned my head back to rest, the woman asked if I was a Sunday school teacher or a minister. We chatted briefly, and the Japanese man, who spoke pretty good English, appeared interested. When the lady turned to talk to her husband, the Japanese man started asking me nice, general questions–where I was from, my family, where was I going. I noticed he was reading a Christian book about the meaning of life, so I assumed he was a Christian. I asked him some questions from a Christian perspective, but his answers (and confusion) quickly told me he was not a Christian. As we talked, I learned that he was a very successful businessman, with degrees from the University of Michigan and Georgia Tech, and he had taken some Harvard business courses. He was flying home to Japan where he and his family lived. I learned about the Japanese way of life, the seven-day work week, and the five-and-a-half day school week. He shared with me about his childhood; his father was a very successful construction company owner. He told me he could never remember his father eating dinner with the family, and only once does he remember “playing” with his father. Now that he was in his mid 40s (so much for my age estimate), he wanted to be more that just a money maker for his family. I asked him how he got the book he was reading. He said his favorite business author, Peter Drucker, seemed to quote this book often. Where God took our conversation from there was fantastic. For about two hours we talked back and forth about the spiritual side of life. He confessed that he practiced no religion. If he claimed any religion, it was a mix of Buddhism and ancestor worship. He said he really felt some “hole” in his life. What he was beginning to learn (and believe) from the book he was reading is that significance was far more important that success in life. I shared my testimony, how at the age of 16 I became a Christian. He said, “It must have been wonderful to be at peace in your heart for so long.” I learned he had very little knowledge of God, had only heard of Jesus vaguely, and had real trouble believing a person could rise from the dead. I also learned that neither he nor his wife owned a Bible (nor even read one). I wish I could say he prayed to receive Christ right in his plane seat, but he didn’t. The truth, is he knew almost zero about God, Christ, or Christianity. But he knew he was searching for more than what this world could offer. I asked him to receive Christ, but he still didn’t understand. Evangelism starts with seed planting. But you never win an argument with God. As we went our separate ways in the Japan airport, I handed him my Bible and told him, “You will find significance if you read this book.” He was humbled as he received it, and I was humbled as I gave it. Amazingly, I was at peace, too, about giving away the only preaching Bible I currently own. God taught me a lot of lessons in my encounter with the Japanese gentleman. One of the neatest lessons: my mission work began in mid-air, hours before I landed in the Philippines. Ed Stetzer, who works with the Southern Baptist North American Mission Board, says if you get serious about spiritual formation, you will have to deal with satanic oppression. Spiritual warfare is a given. We can’t change the world by signing petitions. That’s a worldly weapon. You can sign all the petitions you want, but that’s not how to change the world. I think Satan has been very happy with the United Brethren church for the last number of years, while Jesus has cried tears over us. We need to change that so the Lord is pleased and Satan is not. But Satan won’t give up easily. He’ll throw everything at you. Ministry isn’t easy. We’re in the trenches fighting hand-to-hand. United Brethren churches in the midwest and mid-Atlantic regions are invited to schedule a performance of “Godspell” during the summer months. Student actors and musicians from Huntington University will launch the summer tour of “Godspell” with a free show at College Park Church (Huntington, Ind.) at 7 p.m. on June 8. Then they’ll hit the road, anticipating doing up to 40 performances. For booking information, contact Paul Hirschy at 260-359-4357. For the third consecutive run of the production, director David Shamburger has incorporated a “Survivor” meets “Castaway” theme into the Gospel of Matthew. Godspell includes almost word-for-word retellings of several of Jesus’ parables. “While the ‘stoic’ thinkers of the past and present find themselves locked up in their ‘ivory towers’ and eventually falling to their knees, our band of players find themselves on a deserted island in what might be considered ‘Paradise,’ free from the rigors of legalistic thinking and exploring a new kind of journey led by a native islander named Jesus,” Shamburger said. The 2008 Godspell tour features powerful acting and vocal performances as well as a live band with guitar, piano, keyboards and drums. Leading up to the production, students completed a semester-long course and a two-week “boot camp” to prepare them for the rigors of approximately 40 shows between June and August in the Midwest and Mid-Atlantic regions. Our first consultation was in December 2006 at Banner of Christ church in Byron Center, Mich., in the greater Grand Rapids area. Pat Jones made monthly coaching visits for the next year. Isn’t that great? What stories of life-change can you tell from your own church during the past year? I want to hear them. Write something in the comments. You always need to organize yourself beyond what you are. If you’re a church of 200 and want to be a church of 500, you need to organize like a church of 500. Otherwise, you won’t get there. When I became pastor of Mainstreet Church in Walbridge, Ohio, we started at about 220, grew, and began adding staff. I took the staff to larger churches on little field trips. How does it look and feel? How do they structure themselves? We began to tinker. God blessed us and the church grew. Over half of our growth was new converts. You get people who don’t know anything, and it’s fun. You get a chance to infect them with the real disease. I covet that for you. Not that you get big; that doesn’t make any difference to me. What makes a difference is that you become effective in what God has called you to do. 20 May Also Receiving Their Degrees…. Among the proud parents at college commencements this month were all three Global Ministries staffpersons. Carissa Burkett, daughter of Phil and Darlene Burkett, graduated from Azusa Pacific University on May 10 with a degree in Fine Arts, with a concentration on sculpture. Jessica Hollopeter, the youngest daughter of Jason and Donna Hollopeter, paraded with 215 other Huntington University students on Saturday. Her degree was in History. Jeff Bleijerveld’s daughter Julie Navrotsky graduated on Saturday from Indiana-Purdue Fort Wayne (Fort Wayne, Ind.) with a degree in Anthropology, while her husband, Rick, received his Business degree. Confronted with the price of gas and a 20-mile daily commute to the office, Jeff Bleijerveld and I thought it made sense to ride together. So today, I picked him up. We both live on the southwest side of Fort Wayne, maybe a mile apart. It was good fellowship, we saved money, and we reduced our carbon footprint. Churches don’t have nearly as many meetings as they once did. Monthly board meetings have become bi-monthly or quarterly. We’ve dispensed with lots of committees that once seemed necessary. We’ve streamlined our church structures. Streamlining is good. But now, church meetings don’t only take up a person’s time. They also hit the wallet. Every trip Pam and I make to church costs us around $5. Other people drive much, much farther. A single board meeting could involve a collective cost of $50 or more. Since we’re a low-income church, gas hurts. So whatever awaits us at church, whether a meeting or music practice or a service, needs to be well worth not only the time, but the gas money. That, of course, should have always been the case. But money has a way of focusing our attention. Marie Else, wife of Warren Else, who pastored in Kansas, passed away early in the morning on May 19 in Abilene, Kansas. Viewing: Thursday, May 22, 6-8 p.m., at Martin Becker Carlson Funeral Home, Abilene, Kansas. Funeral: 2:30 p.m. Friday, May 23, at Abilene United Brethren church.